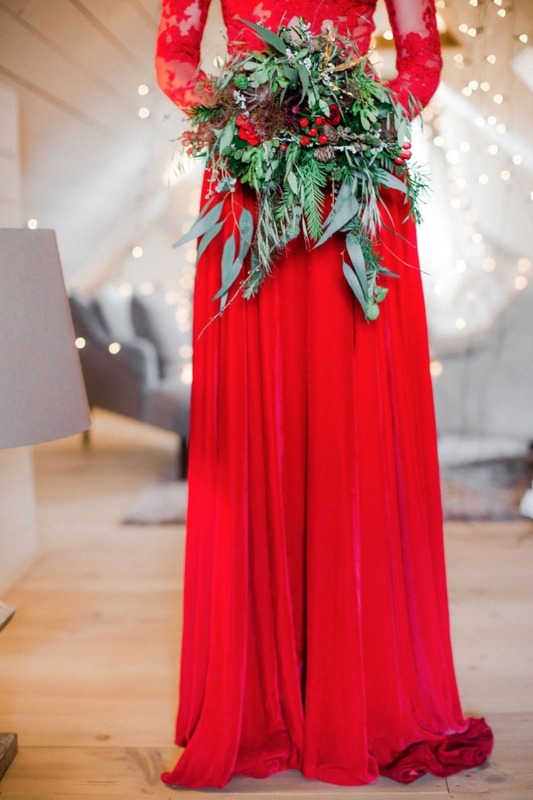 Now THIS is how you rock a red dress at your holiday themed wedding! 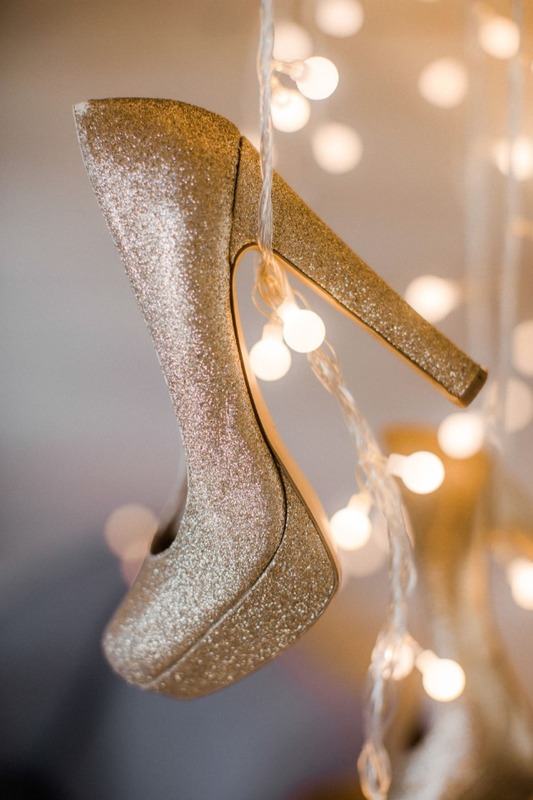 So stunning we can hardly look away! 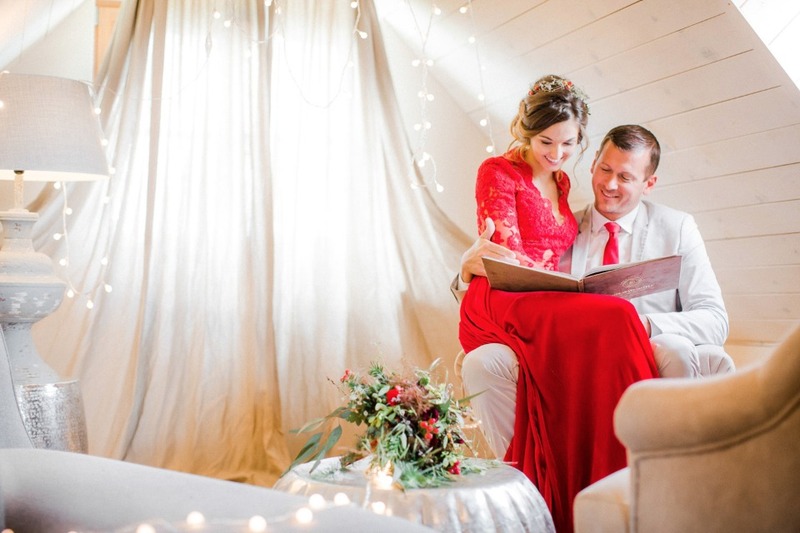 Which is okay, because we have tons more images of this gorgeous Eva Poleschinski dress in our full gallery! 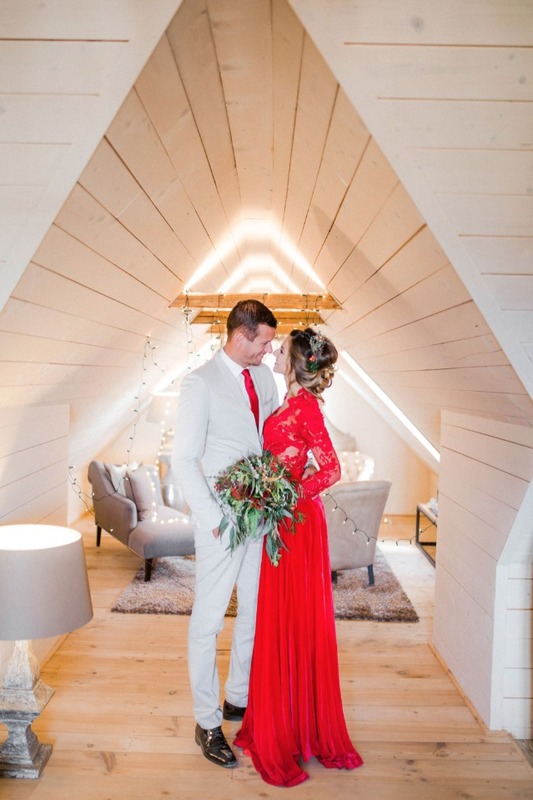 Be sure to check it out to see them all and to find even more details from this amazing red and green wedding shoot at Golden Hill Country Chalet & Suits. 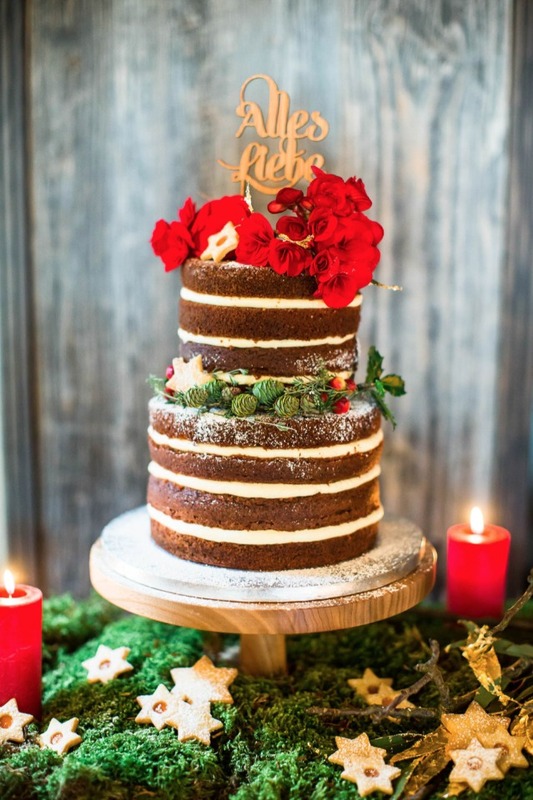 Thank you so much to Die HochzeitsFee and Miriam & Manuel Photography for sharing with us, this wedding inspiration has truly put us in the holiday mood! 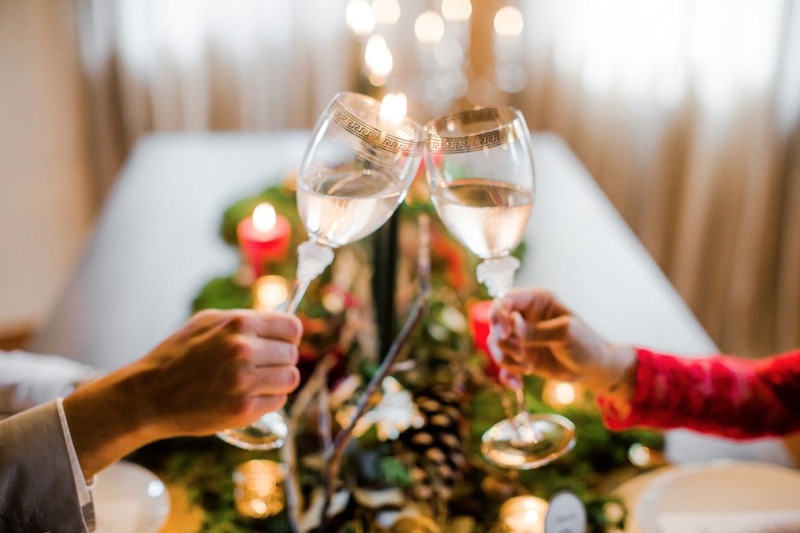 From Die HochzeitsFee: Austrian coziness and the pre-Christmas feeling of happiness are combined with the delightful scent of festive spices of all kinds. 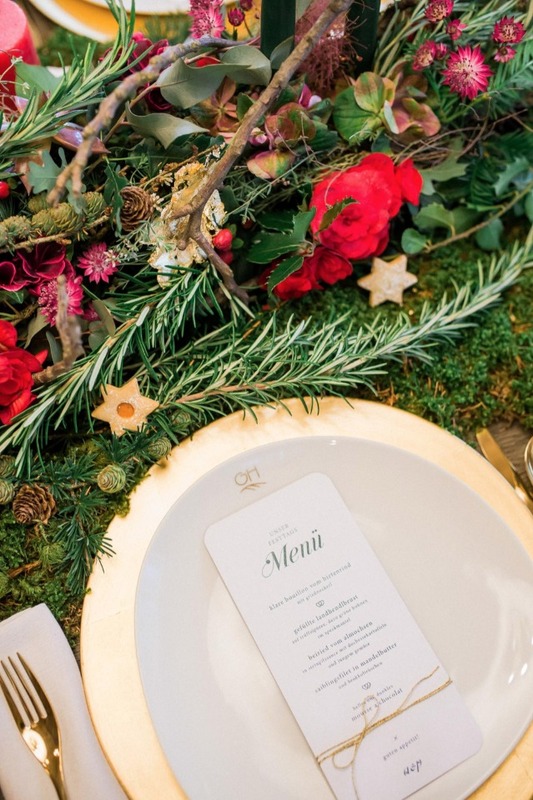 A luscious red and rich shades of green unite with delicate lace and chic gold. 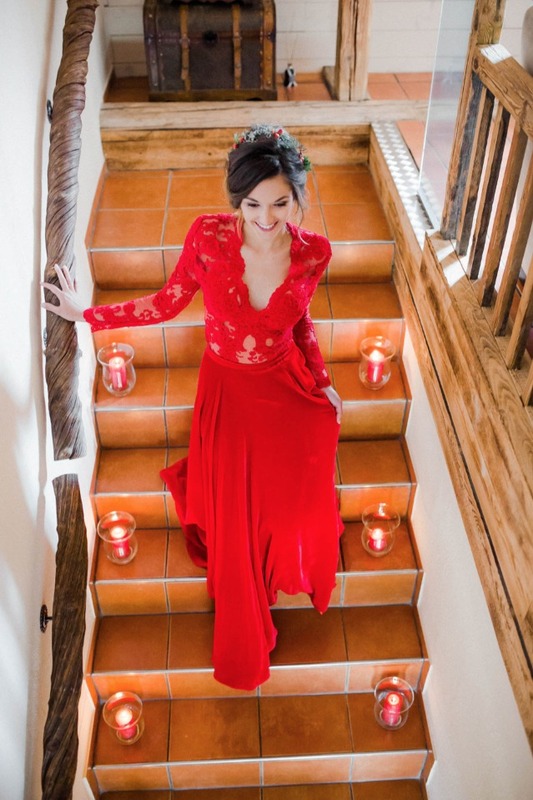 We are so blown away by this fabulous red dress by Eva Poleschinski! 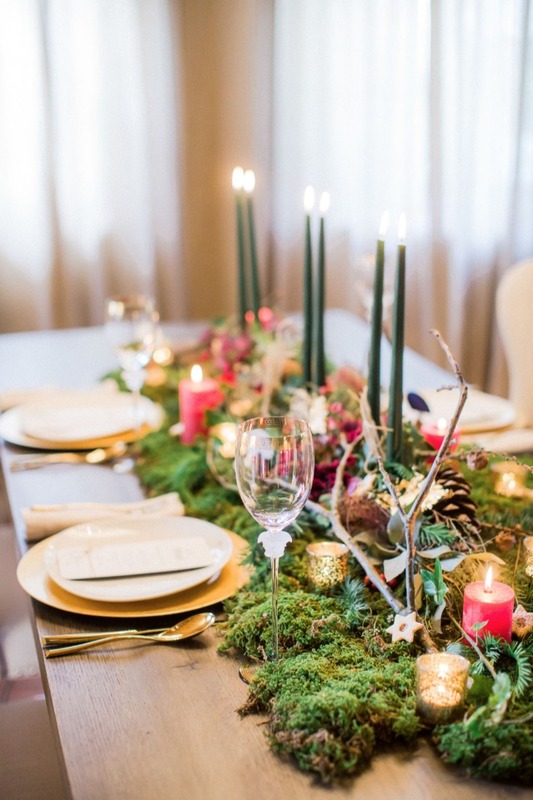 it feels like the perfect accent to a wedding day in December! 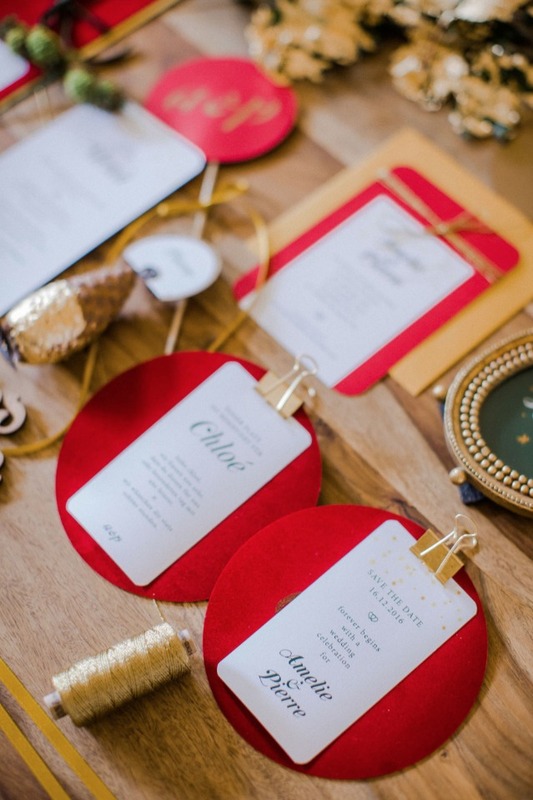 But what if you are looking to rock an alternatively colored dress for a wedding that isn't during the holidays? 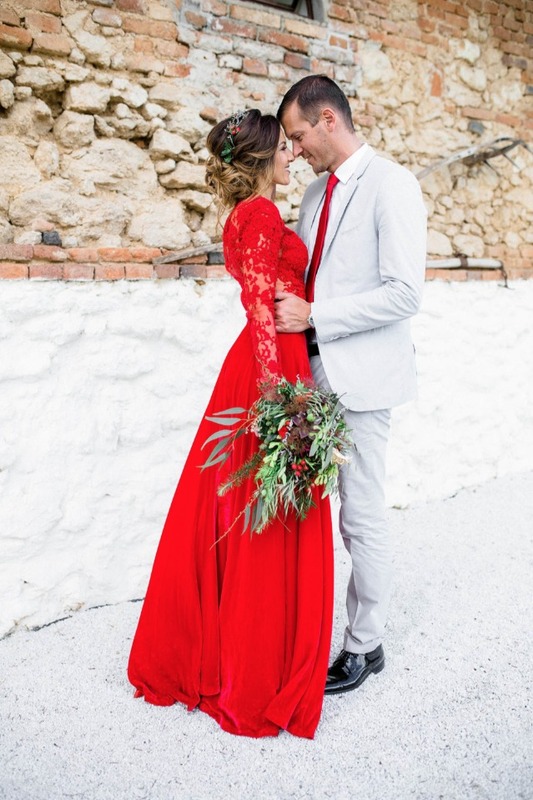 Oh well might we suggest this gorgeous shoot filled with red and gold spanish wedding ideas! 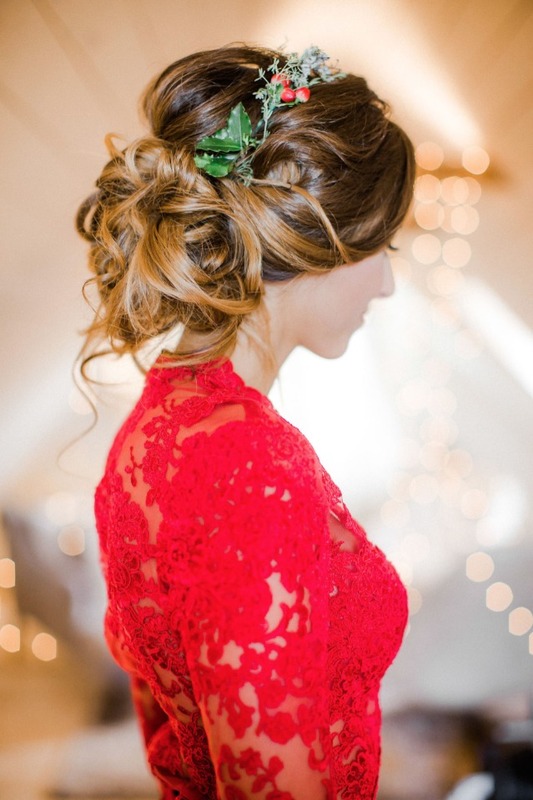 Not only is the dress jaw dropping but the whole day is beyond beautiful! Amidst the Austrian region of Styria and between vineyards, the noble country house and luxury chalet “Golden Hill” can be found. 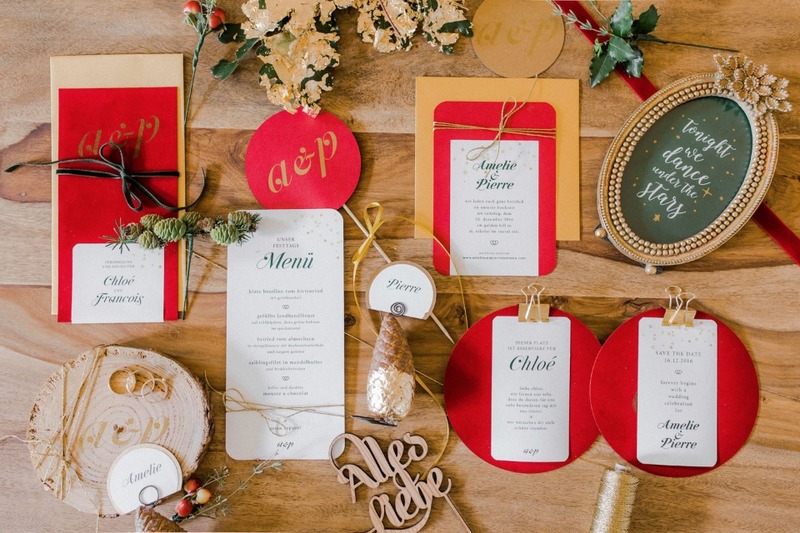 When wedding planner Lisa Schöninger, who owns the company Hochzeitsfee, discovered this extraordinary place, the idea of doing a romantic and elegant Christmas-themed photoshoot was born. The property’s owners stress style and exclusivity and it shows in the furnishing, which was done with a lot of attention to detail and caution. The conditions were used perfectly to capture the magic of winter with all its characteristics e.g. candlelight and the scent of cloves. Through the whole chalet streamed a smell of freshly baked cookies, cinnamon and dried firewood. A truly romantic feel-good atmosphere. 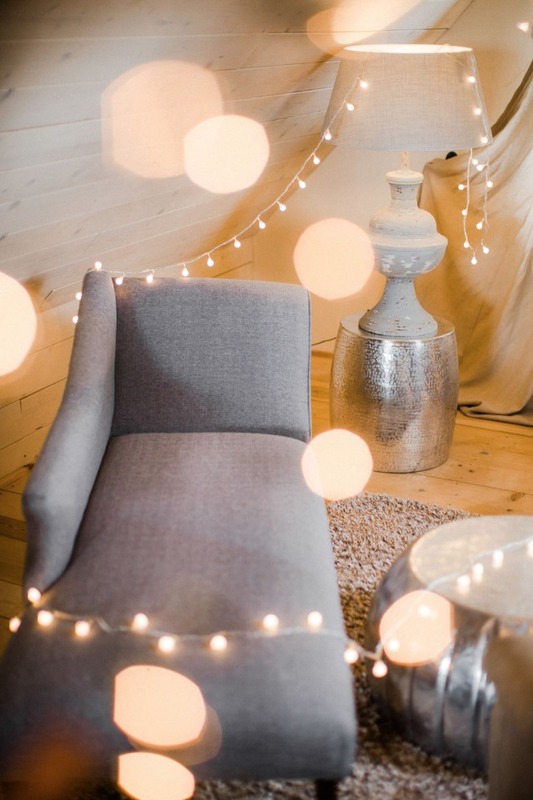 Are you in love with this beautiful shoot? Us too! 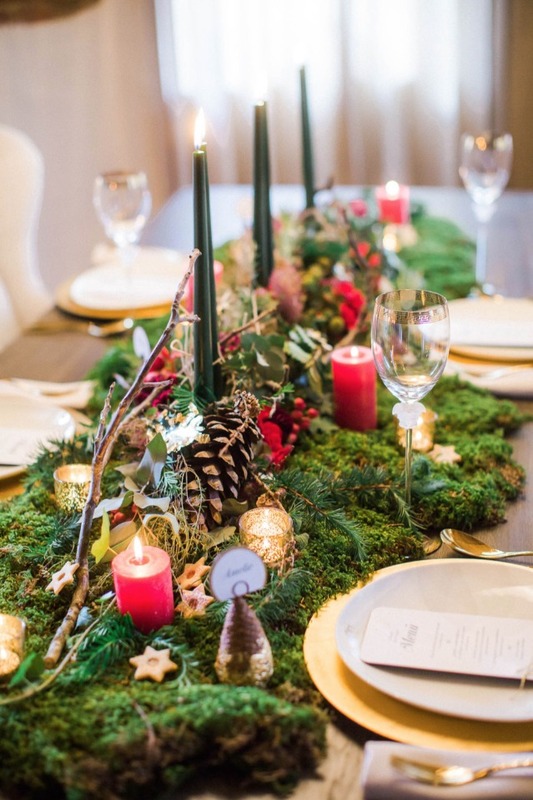 Get a closer look at the whole day with this lovely film from Meine Schokoladenseite!